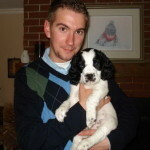 Home / FAQ / What is Crate Training? 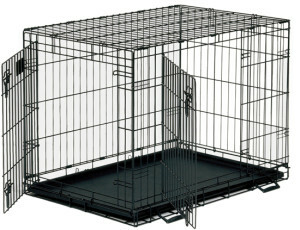 Crate training is the use of a crate/cage when potty training the dog. According to many professionals a crate should be the size of the dog. They must be able to stand up, turn around and lay down. If it is bigger than that your puppy may eliminate in one corner and lay in the other corner. Without crate training, the puppy will not learn to hold it. The first and foremost reason the crate should be the size of the dog is because dogs prefer smaller spaces over larger spaces. In some people’s minds a crate training seems cruel and like a prison. They think locking up your dog is inhumane or think bigger is better. However, when studying dogs, you will find that when a dog wants to be alone, and by itself, it chooses to find a small space to hide or sleep. That is why dogs like to lay behind or under couches or in small corners – out of the way. 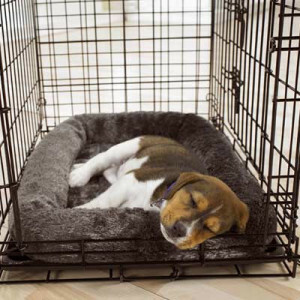 By crate training your puppy, you are providing the perfect place for your puppy to chill. Just like people they have a moment in the day they would like to be away from everything and just be alone. You will find that when you are home and you leave the crate open you may occasionally find your dog there resting. A crate is a sanctuary for a dog, it is their den. Treat it like a home, it is special to them. 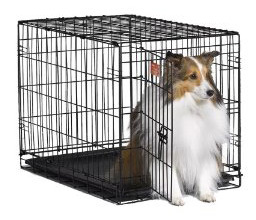 Therefore never lock the dog in a crate as a way of punishment. That is not a proper use for crate training. 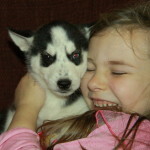 If you have little children do not let them in the crate with the dog. It is theirs – stay out of it. 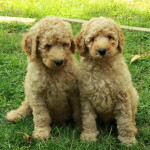 You will have to determine what size your dog is going to be, that will be the size crate you want to buy. When you buy a crate buy one that has a divider. This divider can be moved in the crate to make it bigger till it is no longer needed. 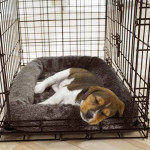 You move it up as your puppy grows, that way it will always be the right size for your pup and he will always feel comfortable and secure with his crate training. Now comes the good part of crate training. As long as it is the right size, your puppy will want to keep it clean. He does not want to pee or poo where he sleeps, so he will learn to hold it pretty quickly. When the puppies are here with us, they will sleep together in a large area and are not used to crate training. 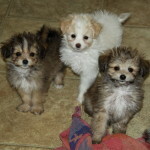 They can bundle up with their litter mates and be totally comfortable . But in your home he should get used to crate training right away. It will be somewhat of a shock to him. It is recommended that you leave your puppy COMPLETELY ALONE, DO NOT UNDER ANY CIRCUMSTANCES visit your puppy in the night, do not let it out, do not check on him, leave him alone. He needs to understand that you are not going to be there at night. Ever. From our experience, and our clients have confirmed this as well, your puppy may cry for two nights, and will be quiet the third night. That is the night he is starting to understand that crying is no use, nobody is coming, he may as well sleep. TWO NIGHTS CRYING, THIRD NIGHT QUIET!!! You have to be firm with crate training, your puppy has super hearing, so he will hear you when you think you can sneak into the area where he sleeps because “I just want to see if he’s okay”. Trust me, your puppy is absolutely safe when crate training, nothing can happen to him, as long as his collar is off (you can not have anything in their crate that could strangle him of course). Every time you think you need to check on your puppy, add another night of crying, because you just encouraged him, that his crying works to get your attention and this crate training process will continue on and on. Please be patient with your puppy as he just moved away from his siblings, experienced a (long) car ride, with strange people with different smells (no offence), now in a different environment, that seems like a new planet to them and all alone… Your puppy may even vomit from the car ride or have diarrhea afterwards, all because it may experience some stress or nervousness. Using the crate training method is now more vital for the puppy to help him feel more comfortable and at home in his new surroundings. Still he needs to be treated as if you have had him for years. Do not adapt to your puppy! 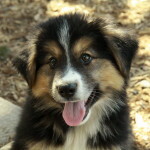 Your puppy needs to adapt to your lifestyle and schedules. If you go to bed at eleven and get up at seven, then your puppy does the same thing while crate training. Do not get up in the middle of the night to let it out for a pee. I have spoken to a client who had a dog for ten years and for ten years every night he had to let the dog out at 3 a.m. All because he gave in and did not use crate training when he first got the dog. The dog got used to the routine and would not let him change it. He later wished he had used the crate training method! It is important that you don’t feed your puppy too close to bed time of course. It’s like giving your child a glass of water right before bed, you know that you’re going to have an accident. I would say you probably would not want to give food to your pup within 4 hours before bed while crate training. Your dinner time is theirs as well. That way you can let him out right after dinner and at least once before bed, that way your puppy will have had plenty of time to work it though its system. Now your puppy will have less chance of having an accident in the night. Then in the morning, when you get your puppy up, do not let your pup even touch the floor when you open the crate. 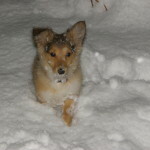 Pick it up and walk it outside if you can (only the first few days, till it knows the routine and the crate training is going smoothly), that way it will not have an accident on the floor before you even reach the door to outside. Especially because he may be very excited to see you and accidentally empty his bladder on your floor. By doing this he will be forced to hold it till he is outside, now you let him down and if he really had to go, he will go. And you have accomplished your first step towards crate training your dog, please praise your puppy with lots of positive words, be excited for him, happy tones in your voice make the puppy want to repeat his action. 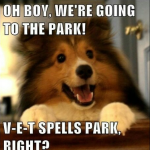 The crucial time is very short, because once it’s out, it’s out of mind, you have about half a second (for best results with crate training) to start saying what a good boy/girl she/he is. You can scratch him as a reward too, hold off on the treats for now. Positive words are way more powerful than a treat, also remember they still need to have breakfast. 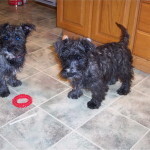 Overall, the crate training method is by far the quickest and most effective way to train your puppy. 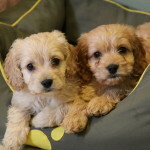 Check out our Full Puppy Training Video Course, with over 50 Puppy Training Videos! 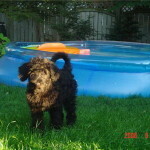 Labradoodle and Goldendoodle Puppies For Sale !